For those just entering the Marvel universe of characters through various films or TV shows, they may not know what the big deal is about certain characters being mentioned or showing up onscreen. The big “Wait, who’s that?” that greeted Thanos’ cameo after the credits of The Avengers is an example where the mainstream needed some guidance as to why nerds were squealing with delight when he showed up. 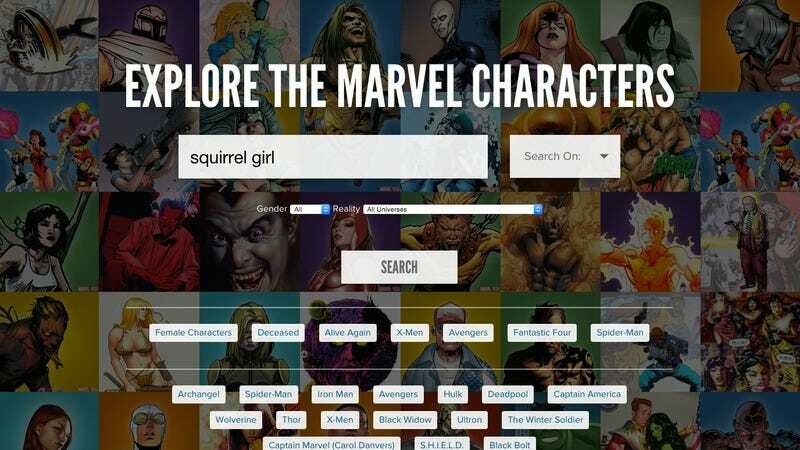 Now there’s an easy-to-use database of nearly all of the Marvel characters who have shown up in the comics over the many years of publication. The Marvelous DB is an excellent tool for those that want to know more about why Bobbi Morse is such a promising character on Agents of S.H.I.E.L.D., or what should have become of Tim Blake Nelson’s Samuel Sterns at the end of The Incredible Hulk. The Marvelous DB is put out by Marvel and powered by Orchestrate, and lets users determine which Marvel reality they wish to search, which gender, and then learn more about that particular character’s publication history as well as their biography within the comic universe. It’s an excellent tool to settle all sorts of nerdy bets or disagreements (“She-Hulk WAS in the Fantastic Four! Twice!”). And while it’s not totally complete—no Forbush Man, Marvel?—it seems to be growing to encapsulate all of them and is tailored to make it easy to learn more about any fan’s favorite new characters.